‘Captive’ (originally titled ‘Unlikely Angel’) by Ashley Smith is the uplifting retelling of her experience being held hostage in her own home by Brian Nichols, a man who had killed several people while fleeing an Atlanta courthouse where he was on trial. Her faith, belief in God, and love of her daughter are what motivated her throughout the long night. She shared her life story with her captor, relating to him in ways others would not have been able to, and spoke to him about God and purpose – both hers and his. Reading to him from her Bible and her beloved book, ‘The Purpose Driven Life’. Get used to this plug, you will hear it many times. While encouraging on many levels, the book was also frustrating. I found myself asking “why would she do this”, “why say that”, or “why in the world didn’t she just…?” Not only in her interactions with Brian Nichols but also in the flashbacks she chose to share. She repeatedly discusses how much she loves and misses her deceased spouse but also tells of how she’d had to learn to avoid making him angry and about a time he knocked her out and left her on the sidewalk. We apologize for the interruption of this book review to bring you a Moment of Sarcasm: Why yes, I can understand missing that kind of treatment and mourning the fact that example wouldn’t be around for your young daughter to judge her future boyfriends by. But still, life is life and you feel for her presumed loss. That is until she shares the fact that he was killed because of a drug deal, in a fight he started, one that had died down (pardon the choice of words) but that he refused to let go. This mixed with her inability/unwillingness to get and stay clean herself, even to regain custody of the daughter she claims to love more than life itself, make it very hard to relate to her and root for her 100%. Because she was trying to share the memories that she spoke to Brian Nichols about that night, the timeline jumps back and forth. While this style can be done well, in this case it came across as repetitive and annoying. Did I mention she repeats herself? She shares some of the same stories and facts over and over again. Often she reiterates the same information, sometimes using new words, sometimes not. If this was a work of fiction it would be a failure, but you have to remember true life is “stranger than” and often makes much less sense. We were sent this book as a pre-cursor for the movie by the same name, and its upcoming release, September 18th in theaters near you. I love both of the actors picked to portray the main roles. Kate Mara was excellent in ‘House of Cards’ and long before his nominated performance in ‘Selma’, my husband and I have been watching David Oyelowo in ‘Spooks’ (That’s MI-5 for you BBC America viewers). I have no doubt that these actors can elevate the material, given a solid script and a good director. I wouldn’t say I hated the book, but it did leave me flustered. Had this been my only connection to Ashley Smith’s story, I would have walked away unsatisfied. 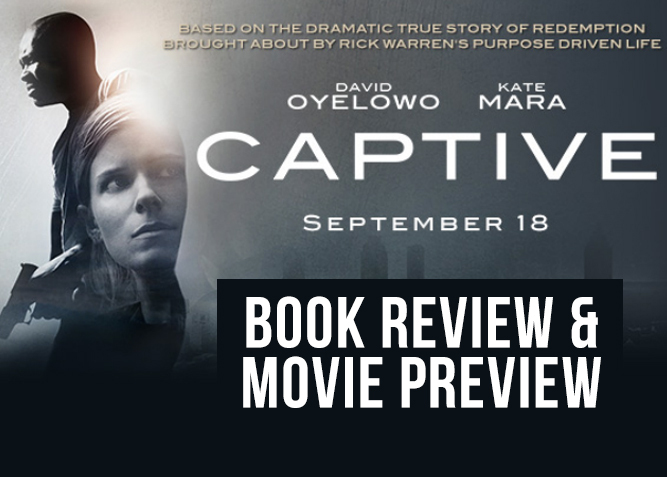 However, I’m looking forward to seeing ‘Captive’ “2.0” on the silver screen. More polished and with a Purpose Driven story that gives you hope without the heavy baggage. If you would like a FREE copy of the book to read (and judge for) yourself, leave us a note in the comment section below. We’ll be picking a winner on September 18th. Melody is a mother of four and wife to one very proud husband, Christian Lee. She has recently made the move to be a stay at home Mom, where she can nurture and raise the youngest two children, which include a baby that comes a week after this publishing. See more about her life in the web comic ForeverFamilyComic.com.